Each year, some facet of orchid growing comes along that I am at a loss to explain. This year, it was the length of multi-floral Paphiopedilum bloom spikes. My spikes were much shorter than in previous years. This was true on Paphs I have had for many years and bloomed many times. It was also true for newly repotted Paphs and for those that had not been repotted for years. My conclusion, before our local orchid show, was that I had reduced fertilizer levels during winter too much or perhaps the cooler than normal winter was responsible. Imagine my surprise when several hobbyists and commercial growers were complaining about the same thing at our local orchid show. How is this possible? We all grow in different media and locations, but something in common to all of us influenced the growth of spikes. The only common thread is that plants in all of our greenhouses were located in the same general area and experienced the same external swings in temperature and humidity. We often like to think that we can bend orchids to our will, but once again, they are responding to nature in ways not easily explained. It is clear though, that my individual growing conditions were not responsible. This is also another good reason to join your local orchid society and get to know your fellow growers. We all share in many different ways. 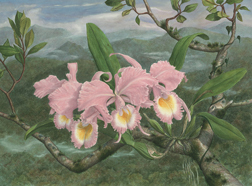 Commercial growers in the U.S. have been forced to purchase many of the orchids they sell from large pot plant growers. While we may lament the loss of many different unique hybrid lines that were characteristic of smaller orchid nurseries, amazing orchids have become common place because growers offshore can grow out thousands of seedlings, select the best of the hybrid and clone it. The select orchids show up at the big box stores, often without names. Even so, this is how many people get hooked on growing orchids as a hobby. There are reports from some serious hobbyists who test these clones for orchid viruses that many test positive for common orchid viruses. New hobbyists that begin their collection with such plants are doomed to have collections of virused plants by the time they understand how to prevent the transmittance of viruses from plant to plant. A recent visit to one of the “big box stores” found many orchids in bloom for sale, including nice, well bloomed cattleyas clearly showing flowers infected by common orchid viruses. The discovery of the first flowers that we now know were infected with orchid viruses was met with generous praise in the orchid world. They were viewed as beautiful sports to be prized and propagated. Now, we know better! It is unfortunate that these diseased plants are being sold today as healthy in garden centers. No one there was even aware that they were selling diseased plants. There are times where virused plants should be preserved because of their unique place in hybridizing history or they still have unique potential for hybridizing. There are a number of these in my collection that are waiting for the day when a technique for eliminating viruses is developed for orchids. The large commercial suppliers should be developing such techniques and not selling and shipping diseased plants.